nailhed: "A Walk Through the Neighborhood"
"A Walk Through the Neighborhood"
The Saint Luke's Hospital and Children's Home at 224 Highland Avenue, in Highland Park, Michigan is yet another burned out ruin on a street particularly full of them. 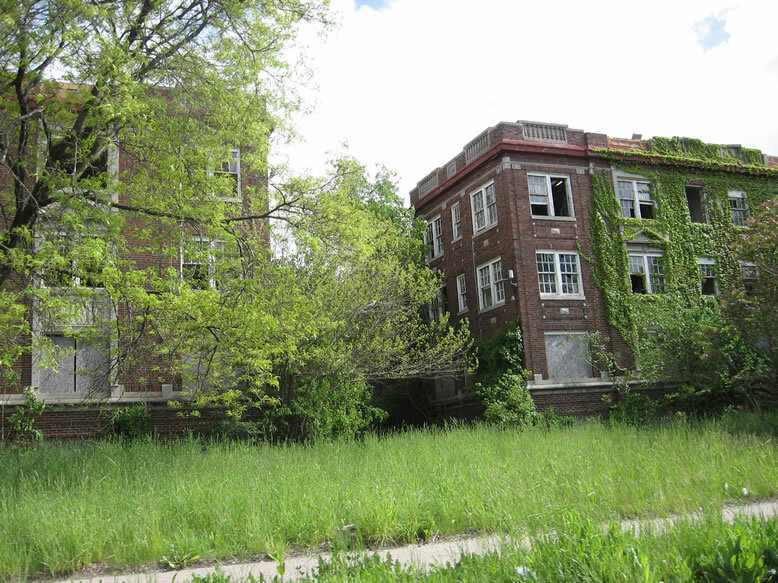 Other wrecked buildings I have explored in this immediate area included Ferris Junior High School, Detroit Osteopathic Hospital, the Roselawn Apartments, Highland Park High School, Highland Park Fire Department Engine House #4, and 70 Highland. This building was recently featured in a local TV news story about confidential records being left behind there. Thanks to my colleague Ben Gravel, I know that St. Luke's was built in 1918 and designed by John Scott & Co., architects (best known for designing the old Wayne County Building, which I explored in an older post). Architecturally, the plain St. Luke's pales in comparison to Scott's magnificent temple to Wayne County, and shows no resemblance. Sanborn maps show an addition built in 1925 as well, and names the facility "St. Luke's Hospital & Home for the Aged." A writeup on elderweb.com refers to it as the "St. Luke's Hospital and Church Home," and says that it was first made possible back in 1861 by a $1,500 bequest from Mrs. A. C. Caniff. The first permanent building was built in 1868, a gorgeous brick structure at 1287 West Fort Street (now equivalent to 1603 W. Fort). It was demolished long ago, and by 1921 the Sanborn map showed the Paige-Detroit Motor Car Co. Plant #1 standing on the spot. The program was operated since its inception by St. Paul's Episcopal Church, making it the oldest still operating "institution with hospital features set up in Michigan under Protestant auspices," though I am not certain they still continue to operate today. I think St. Luke's Home moved out to the suburbs, and sold this building in 1995 to the non-profit group Metro Emergency Services. Also, St. Luke's discontinued their hospital function at some point as well. The new owners received multi-million dollar contracts to house the homeless and provide mental health services here at St. Luke's, operating under the name Doorstep West Homeless Shelter. According to the news report by wxyz.com, Doorstep West apparently ceased to exist in 2006 when John Rutherford, the head of Metro Emergency Services, was indicted for diverting an estimated $1.3 million in grant money into his own pocket, and another million to his property management company, DPR. A federal investigation found that some of the money Rutherford embezzled went to the coffers of now-imprisoned former Detroit Mayor Kwame Kilpatrick and his father Bernard Kilpatrick. Mr. Rutherford went to prison and the old St. Luke's Home was abandoned. Though he has already finished his sentence, nothing was ever done to make sure the records were kept secure, in accordance with state law. Local TV news station WXYZ was tipped off that thousands of confidential patient and employee records were left abandoned here, reported to them by a medical worker who somehow happened to find them "while on a walk through the neighborhood" (translation: he was snooping around and up to no good, just like me). This building has been set on fire at least three times since 2010, but as far as I know the piles of records are still sitting in there. Out back on the next block behind the St. Luke's Home stood the crumbling ruins of the Balfour Manor Apartments, a somewhat unique structure wreathed in overgrowth. According to the Sanborn map its address is 241-245 Glendale Avenue. From a Google Books search of that address range, quite a few hits come up in yearbooks and similar directories that show a lot of educated people having resided in this building, from the 1920s to 1970s, at least. I'm guessing that this might indicate that nurses from the nearby Detroit Osteopathic Hospital, or teachers from the nearby Highland Park High School may have chosen this building as their residence so as to be close to work. There was also at least one Episcopal lay person listed as living here in 1947, perhaps someone who worked at St. Luke's itself. Volume 90 of the journal Engineering News-Record, states that the Balfour was designed by noted local architect Charles N. Agree, and was built in 1923 of brick and Bedford limestone, with 86 living units. The ruins of the Balfour Manor were finally demolished in 2012. Hudson Plant, Part 1: "That's Terraplaning"
Hudson Plant, Part 2: "Overbuilt"